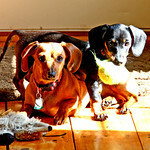 Doxie Archives on Hillbilly Hill Farm: 25 years and counting! 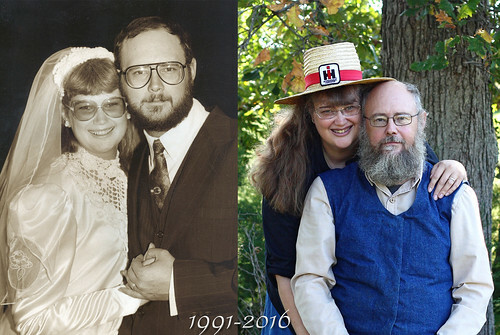 I don't know how I got so lucky 25 years ago today, to marry this wonderful man I'm married to, but God was sure looking out for me when he brought us together! Yes, to some people he may not be perfect, but I'm so far from perfect myself, I think he's way to good for ME! I do know he's PERFECT for ME, and that's all that matters! I'm also blessed cause he thinks that I'm perfect for HIM, even though I don't know how most of the time. He is the sweetest, kindest, most gentle...in words and actions...MAN I know, and I'm so blessed that he's mine! I will never be able to put into words, how much he means to me. All I can really say is, that without him, I don't know where I would be now as he has helped me make it though the tough times...when I'm not strong enough to make it on my own. God knows what we need before we do, and I'm so grateful he KNEW I needed this fantastic Man and kept him for me. We may not be "where" or "who" we hoped we would be, all those years ago in some respects...but we are who and where we are...and I have to say I'm loving the ride, even if it takes us off the beaten track at times! Those unexpected turns usually turn out to be the best!